Ron the Balloon Guy is proud to offer you the very finest in products and services. We take pride in making your Grand Opening or Sales Event a memorable occasion with a courteous, friendly, reliable staff of experts. We appreciate our clients' needs and take great satisfaction in your success. Our giant cold-air inflatables are one of the most effective means of attracting potential customers' attention to your event, location or product. Your business will make an imediate impression When you display a colorful giant inflatable. Create a lasting vision in peoples' minds, causing them to remember you long after the promotion is over. Our most popular hot air balloon shape allows for a large 8' x 14' banner with either a custom or generic message. These come in an array of color combinations allowing you to cordiate the inflatable with corporate logos or colors. On average it takes seeing an image eleven times before it penetrates the subconsious. 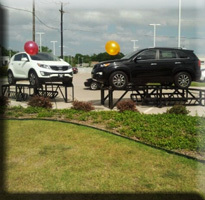 Rooftop or Ground mounted balloons allow you to use your advertising dollars to their maximum benefit by concentrating on your most potential source of new customers - the people who drive by your location on a regular basis. Get your business noticed! We provide top notch event services with over 10 years experience.